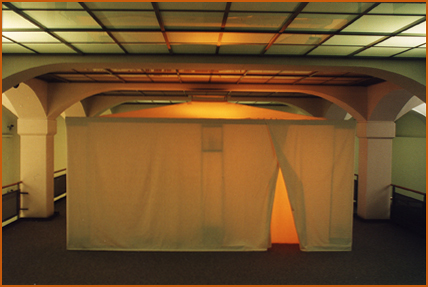 The set of projects entitled “Sonic Rooms” is our first commonly realized work cycle which does not, as earlier works did, aim at the acoustical staging of the given performing space, which would make the room itself sound, while taking into specific consideration the special conditions offered by the respective location. 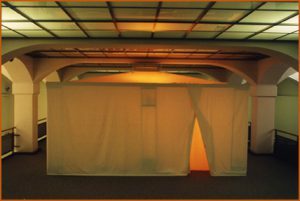 Thus, the location of the Space-soundBody’s presentation is not crossed – in this case acoustically – in its architectonic dimensions, a process which would render the room itself “audible”. 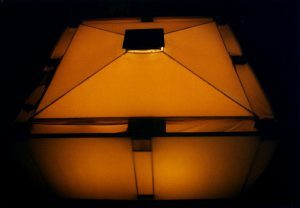 For instance, by the interior of the Space-soundBody entitled “SonicTent” which is – easily as well as effectively – separated from its surrounding space by a double fabric cover, the visual aspect of the artistic design of space and time is excluded to the largest possible extent – an aspect, by which the auditive reception of the artificially created virtual SonicRooms is intensified. As visual contact, a crucial premise for orientation and localization, is prevented by thin draping which is impervious to light, but permeable to sound, it is possible to create unreal-imaginary “SensorySonicRooms”, where actually moving sounds, which are perceived only by the ear, are experienced as an amorphous continuum of fleeting and unpalpable conditions and acoustic atmospheres. Paradoxically, the artificial three-dimensional perception of sound is even enhanced by real movement. 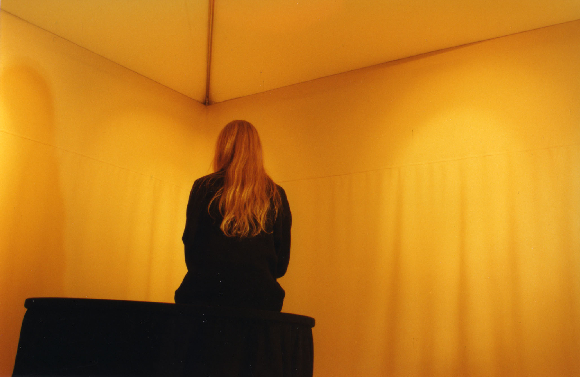 So in order to experience the SonicTent adequately, you have to be there “live”, so that you may, for instance, experience the difference between artificially produced spatial qualities in the stereo image and the artificial character of the psychic “inner” perception of space, which is evoked by sounds covering the real distance between two loudspeakers. Then again, there are artificial “listening islands”, which, in a manner that resembles to listening with earphones , exclude the real listening space by means of surrounding fabric covers and carpeting, so that the artificially produced spatial qualities of the three-dimensional sound composition themselves will gain further authenticity. Thus, at these islands it will be possible to undergo new listening experiences, which, among others, may lead to irritations of the “normal” perception of space and time. In the best of cases, the sounding work of art will evoke a freely flowing space/sound experience, somewhere between the imaginary, psychic inside space and the “real”, physical outside space. All modern perception theories are based on the fact that human perceptions of time and space are interdependent. A distance covered by a person – or a sound – in space is initially perceived as a temporal phenomenon, allowing a person to develop a subjective notion of space and time by measurement and comparison. Thus, movement in space becomes time. Time periods become spatial distances. The sensation of time is realised by the sensation of space and vice-versa. Space becomes an experience of time due to the movement of the sound event. Time accordingly becomes an open, imaginary process of generating illusory space. Rooms which are open, unbounded, liberated from the linearly directed flow of time serve as three dimensional canvases for constantly changing processes generating transitions. Between TemporalSpaces and SpatialTimes, there are manifold variations of IntermediateZones with their IntermediateSpaces and their IntermediateTimes. All this leads to dissolution of the real performing space, where time itself stages a linear-dramatic, goal-directed idea (of space?). Instead, the cyclic, non-linear consciousness of time releases the desire to become “immersed” in psychological inner space, to fade out physical outer space with its real time and its thinking spaces (which are predetermined in their substance) by concentrating on the perception of what might seem on the surface, unprepossessing sound events based on elementary-harmonic, simple sound-materials and -transformations, to set free your vision, or to put it better, your hearing, so that you may experience the present – from one moment to another – as a possibility of transitions, of freely flowing conditions. Individual sound locations and sound sources are, by their movement, turned into a quasi organically proliferating sound line, which – itself interconnected to build an artificial matrix of time and space – offers acoustic images of SpaceTimeNets floating freely in ‘non-time’. Space and time themselves are turned into interactive qualities of perception, constantly fluctuating between the ‘real’ and the ‘unreal’ sensation of space and time. It is exclusively original sound elements of the three basic categories nature-animal-man that constitute the basic and starting material for a variety of artistic transformation processes. By applying most recent computer supported digital technology, it is possible to render the intrinsic molecular structure of noises and sounds audible and thus available to the acoustic arts – to an extent which hardly fifteen years ago nobody could have dreamed of. In a so to speak scientific way and by using so-called digital sound processors (samplers), the carefully investigated, quasi acoustically dissected, amorphous, heterogeneous original sound materials of individual particles of noise/sound/tones are generated. The sound processors serve as a complex of interfaces which penetrate the organic sound structure in order to record, molecularize and then transform its variations. By a continuous, varied interaction of the individual sound components among themselves, iridescent sounding structures arise which display constant changes in their consistency and their density. Within these multi-linear SoundStructures, so-called acoustically “fluorescent” SoundEnvironments thrive on artificially created, self-impelled and self-intensifying loops, their speed and their movement – two parameters undergoing constant changes. These SoundEnvironments again work as an oscillating, symbiotic amalgam between reality and virtual reality which renders the perception of the present more permeable for possible artistic visions – beyond the outdated traditional dichotomies that separate nature from the arts. These specifically created organic-artificial InterEnvironments focus on the generation of transitions; in the transformation of the sound itself into “nature/animal/man”. It is efficient in the same measure as nature, animal or man is transformed into something “different”: pure line, pure colour, pure sound, pure rhythm, pure movement, pure condition etc. So as soon as water/air (like in “SonicRooms No.1”) no longer sounds just like water/air, but is transformed into sound plateaus with their multi-linear intensity streams of sound energies which are free of non-musical-referential meaning, vibrating on a self-impelled basis, substantial sound matter is turned into expressive sound matter. The chirping of crickets (as in “SonicRooms No.2”) mutates gradually into abstract, rhythmic sound figures connected by artificial sound movements with their resulting virtual resonances to form matrix-like SoundColourRhythmGrids. Thus, the artificial soundscape appears as an ensemble of desubjectivised expressive matter in the artistically layered sound system of the horizontal, rhythmic-melodic sound figure and the vertical, resonant-harmonic sound-space.